In the summer the ventilated wall is an exceptional reflector of solar radiation. 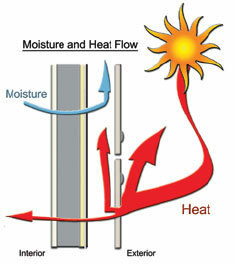 The heat is accumulated on the surface layer & is not passed onto the underlying layers. The heat then escapes the wall thanks to the free-flowing air (The Fireplace Effect). The air gap also helps to prevent the water from spreading inward to the underlying layers. Most of the water will run down the face of the material & most of what does get into the air gap will run down the back of the panel. 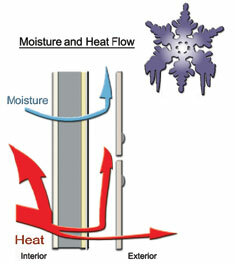 The water will then evaporate & will be able to escape the wall thanks to the free-flowing air (The Fireplace Effect). In the winter the vapor pressure inside heated structures are usually higher than outside, this could lead to the transportation of partial vapor pressure through the outside wall. 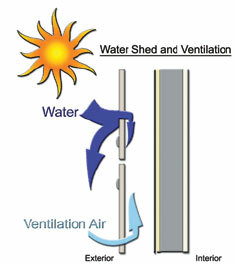 The moisture is then eliminated by the free flowing air through the cavity. The air gap also helps to prevent the water from spreading inward to the underlying layers. Most of the water will run down the face of the material & most of what does get into the air gap will run down the back of the panel. 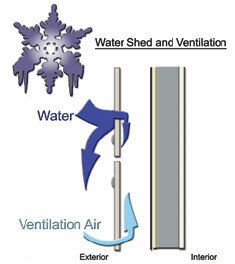 The water will then evaporate & will be able to escape the wall thanks to the free-flowing air.